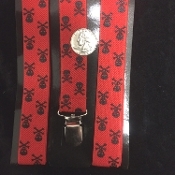 Funky Fashionable NOVELTY PRINT SUSPENDERS UNISEX CLIP-ON BRACES - Red Black POISON SKULL CROSSBONES - Adult One Size fits most men, women and teens. Fully adjustable clip on style, comfortable polyester ONE-inch (2.5cm) wide elastic stretch straps. Polypropylene vinyl fabric enforced Y-shape design cross back, prevents sliding off your shoulders!